I think I may have broken a cardinal rule. A sin and crime punishable by death: I had pizza while on vacation in Texas. At first, I wasn’t even going to write about it (hence there being no pictures). Then I figured I should put it out there that I had a decent pizza in Dallas. This is just a quick note, nothing too detailed. I sat in on one of my friend’s meetings, and the person in charge ordered a couple of pizzas (one pepperoni and one plain) and some garlic bread. When they talked about ordering, I asked myself, “Pizza in Texas? No. I can’t do it.” Then it arrived and I took a look. My sentiment quickly changed to, “Wow, that looks okay. It can’t be any good, but I’ll give it a try.” My first bite changed my outlook entirely. This was damn good pizza. Just as fine as any I get around here; good enough that any homesick New Yorker would be able to enjoy themselves. It was thin crust, perfectly crispy, with the right ratio of cheese to tomato sauce. If I didn’t know any better, I was chowing down on Denino’s Pizza from Staten Island, a childhood favorite of mine. Was there a coal fire? Because that char on the bottom of the crust certainly looked and tasted like it. While the garlic bread was sub-par and way too thick (it was “Texas Toast”, plain and simple), I was thoroughly and pleasantly surprised at the pizza, which came in the shape of an oval. How could this be? Me, enjoying pizza in Texas? What insanity was taking place? They’re actually getting 3.5 out of 5 stars from me, which is remarkable for a pizza place so far away from the Homeland. I never actually visited the location, but the delivery guy upon bringing the order told us the restaurant was formerly known as The Egyptian, and was the location of the last meal Jack Ruby had before he shot and killed Lee Harvey Oswald. Well, I assume he was just there for drinks, because if he had some of this pizza, he might have spared Oswald his life. Go ahead and kill me for getting pizza in Texas, but it was worth it. This post was originally published here. 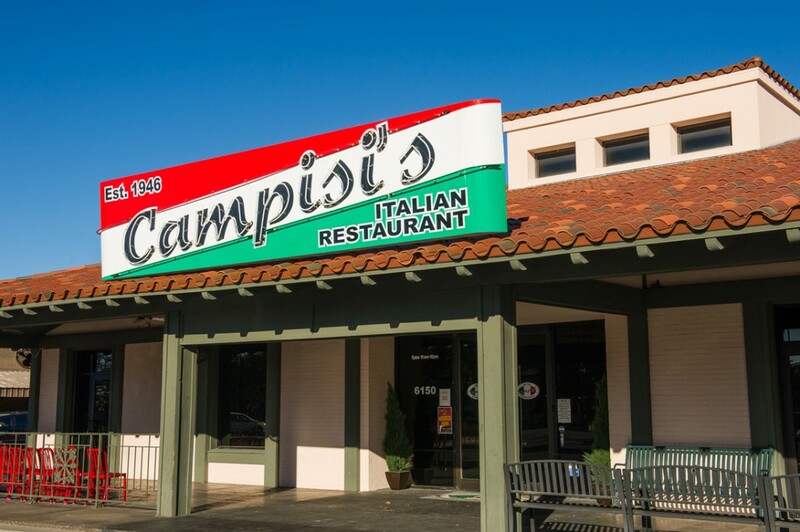 Campisi’s is located at 1520 Elm Street in Dallas, Texas.